To determine the size (meaning length) of the collar most appropriate for your pet, measure loosely around your pet's neck where you want the collar to rest. If the measurement is right on the edge of a size (13 and 3/4 inches, for example) you should get the next size up, especially if the dog is young. To measure the branklet size, measure the front paw,right above the knuckle or the hind leg right above the knee. Molly is wearing a Gold & Ruby Branklet Set in the 1/2 width, a favorite for Toy and Small size dogs. 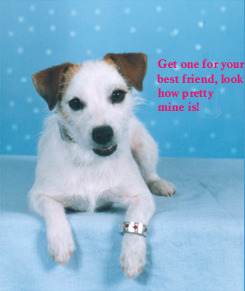 Molly is wearing the popular white gold & ruby Pet Branklet.